Monthly data released this week actually wasn't gloomy. Housing permits, a leading indicator, were above 600,000 for the fourth month in a row. Existing home sales also beat estimates handily. 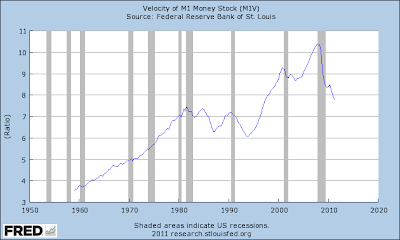 Leading Indicators for August were reported up 0.3% (but see my discussion of money supply below). In the rear view mirror, in the second quarter households continued to deleverage and if the trend continues will be in their best position re debt servicing since before Reagan's presidency by next spring. With the major exception that there are more signs housing prices as well as purchases have bottomed, and a few minor improvements, the high frequency weekly indicators give no grounds for solace. In particular they do not bode well for the September jobs report. Adjusting +1.07% due to the 2011 tax compromise, the Daily Treasury Statement showed that for the first 15 days of September 2011, $103.8 B was collected vs. $104.5 a year ago, meaning that once again there was an actual decrease of $0.7 B. For the last 20 days, $128.8 B was collected vs. $129.1 B a year ago, for a decrease of -0.2%. That this has turned in a YoY loss for the second week in a row is ominous for the September jobs number. The BLS reported that Initial jobless claims fell 5,000 to 423,000. The four week average increased to 421,000. This remains unwelcome and also does not bode well for the September jobs report. 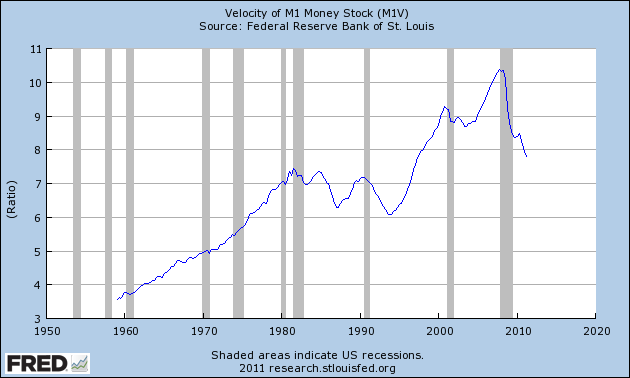 One recent source of good news, the Money supply surge, may be ending. M1 declined -1.3% for the week. 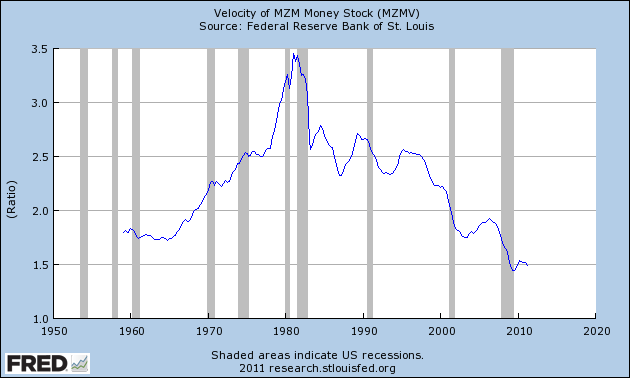 It remains up 1.4% m/m, and 20.9% YoY, so Real M1 was up 17.1%. 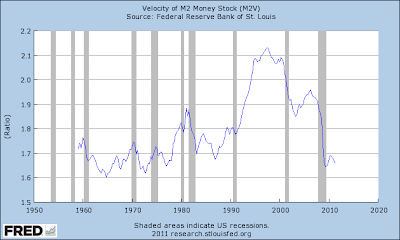 M2 also declined, down -0.1% w/w. 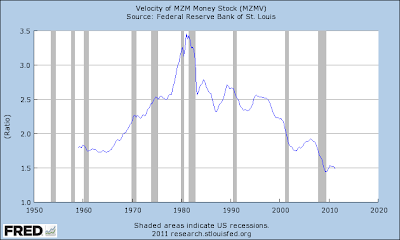 It remained up 0.7% m/m, and 10.4% YoY, so Real M2 was up 6.6%. 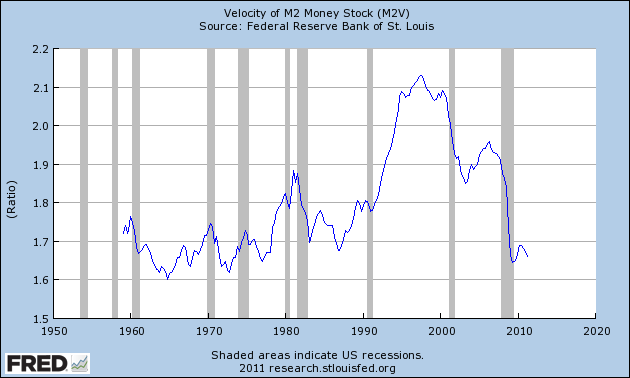 The YoY increase in both M1 and M2 continue near historic high levels. To show you how important this surge has been, had there not been the record surge in money supply in August, the Leading Indicators for last month would have been reported down a very significant -0.4. Oil finished at $79.85 a barrel on Friday. This is close to its lowest close in 24 months -- Oil was last below $75 a barrel in September 2009. West Texas Intermediate has declined by a full 1/3rd in price since its April high of $115. Gas at the pump fell $.06 to $3.60 a gallon. Gasoline usage was actually UP by a grand total of 0.1% YoY, at 8858 M gallons vs. 8847 M a year ago. This is only about the 4th time in just over 6 months that gasoline usage has been YoY positive. While measured as West Texas Crude, oil is about $15 below its recession trigger level, gas at the pump may be the better measure, and this is about $.30 above its inflation adjusted recession trigger level from 2007. Weekly BAA commercial bond rates rose .09% to 5.33%. Yields on 10 year treasury bonds only rose .04% to 2.03%. This continues the recent trend of increasing spreads between these two rates, as well as overall weakness, and so indicates a continuing slight increase in the relative distress in the corporate market. The American Association of Railroads reported that total carloads decreased -.3% YoY, down 1900 carloads YoY to 542,200. Intermodal traffic (a proxy for imports and exports) was up 2200 carloads, or 0.9% YoY. The remaining baseline plus cyclical traffic declined 4100 carloads, or -1.4% YoY. Rail traffic has been negative YoY for 6 of the last 11 weeks. Using the breakdown of cyclical vs. baseline traffic from Railfax, baseline traffic was down 8400 carloads, or -4.2%YoY, while cyclical traffic was up 6500 carloads, or +1.9% YoY. All is not gloom and doom. Several series were neutral or mixed. Retail same store sales had another mixed performance. While the ICSC reported that same store sales for the week of September 17 increased 3.4% YoY, and also increased 1.2% week over week, Shoppertrak reported that YoY sales only rose 1.7% and declined -10.5% week over week. The American Staffing Association Index went back up again to 88. This series has completely stalled at the 87-88 range for 3 months. In the longer term perspective, there is - relatively - good news coming out of housing, which shows more evidence of bottoming both in terms of purchases and sales, and also prices. The Mortgage Bankers' Association reported that seasonally adjusted purchase mortgage applications declined 4.7% last week. They did not report the YoY change, but a comparison with last year indicates a very slight decline. Purchase mortgage applications have essentially been flat for the last 16 months (which is an improvement over the previous 4 year decline). Refinancing increased 2.2% w/w with record low interest rates. As to housing prices, YoY weekly median asking house prices from 54 metropolitan areas at Housing Tracker showed that the asking prices declined -1.7% YoY. This is yet another record smallest YoY decline in the 5 year history of this series (YoY measurements were possible beginning in April 2007). . The areas with YoY% increases in price increased by one more to 15. The areas with double-digit YoY% declines decreased to only 2 -- Reno, NV and Chicago. If the current trend continues, nationwide asking prices will be YoY positive by the end of this year. The weekly indicators this week once again are evidence that the economy is probably contracting slightly. In the longer term, that at long last, households are nearing their best position vis-a-vis debt in one-third of a century, and the housing market is showing signs of an actual tepid turnaround, are affirmation that This Too Shall Pass. Have a nice fall weekend! Debt service payments (blue line, left scale) for the first quarter have been revised to 11.24%. In the second quarter they fell to 11.09%. They are now less than over 3/4's of the last 31 years -- all but the early 1980s and a few years in the early 1990s. 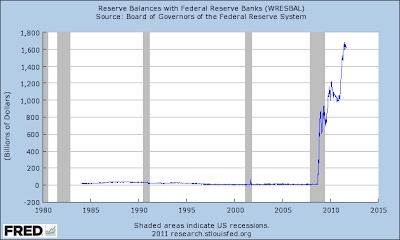 Total financial obligations (red line, right scale) for the first quarter were revised to 16.26%. In the second quarter they fell to 16.09%. Thus, as of June 30 these were already less than at any time in the last 25+ years with the exception of one quarter in 1993. In the longer term, this is good for households, and good for a sustainable economic expansion. A week ago, I said we wouldn't see a longer term recovery until households had adequately deleveraged, housing prices had bottomed at least nominally, as well as new housing beginning to pick up, and the Oil choke collar broken. It looks more and more like 2 of those 3 conditions will be met by some time next year. Grades ranged from a high of C+ for solid waste to a low of D- for drinking water, inland waterways, levees, roads, and wastewater. U.S. surface transportation and aviation systems declined over the past four years, with aviation and transit dropping from a D+ to D, and roads dropping from a D to a nearly failing D-. Showing no significant improvement since the last report, the nation’s bridges, public parks and recreation, and rail remained at a grade of C, while dams, hazardous waste, and schools remained at a grade of D, and drinking water and wastewater remained at a grade of D-. Levees, the newest category, debuted on the 2009 Report Card at a barely passing grade of D-. Just one category—energy—improved since 2005, raised its grade from D to D+. Is there enough income at the top to finance the deficit? Given the turmoil in the markets, I'm putting this up early and will leave it up overnight. I hope it helps to at least explain what is happening. As I mentioned in yesterday's post, the IWNs were already on technically poor ground. Today, they closed right at key support around 65. The QQQs -- which were above the 200 day EMA -- moved through that technical bell weather and are now below an upward sloping trendline started about a month ago. The SPYs moved through the 112 area during the session, but rallied just a bit to close above. In short, today we saw a lot of technical damage done to the market. Most importantly, going into tomorrow (which is Friday), we have a nervous market that probably won't want to hold positions over the weekend. Don't be surprised to see more selling. In contrast, we have a treasury market that is rallying. The IEFS and TLTs have both moved through upside resistance on very strong volume -- especially for the treasury market. Both have bullishly aligned EMAs and are clearly catching a safety bid based on the equity sell-off, the fed's move into a longer portfolio and a general risk off trade. The dollar rallied hard, but formed a spinning top on high volume. My guess is we'll see the dollar pull back to support right around the 200 day EMA -- or at least the 10 day EMA -- before we see a possible move higher. Notice prices are currently at key levels and that there is additional support at the 110 level. 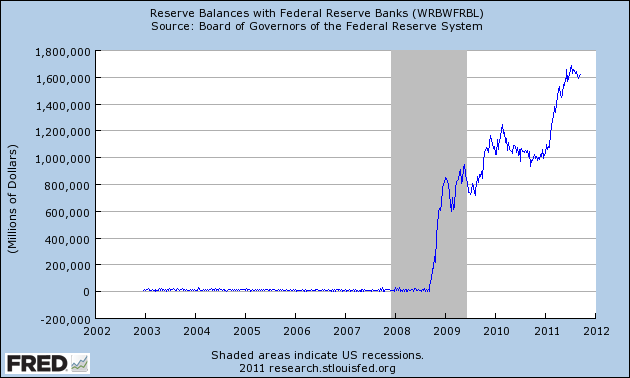 Notice the IEFs and TLTs are now at higher levels than during the recession. That is a very ominous sign. Bottom line: this is a terrible week; it does not bode well. So, no, it's not the huge issue people are making it out to be. Hat tip to Barry over at the Big Picture. On Fisher's Dissent, or, Why the "Regulation is Killing Business" Argument is Wrong. I have posited both within the FOMC and publicly for some time that there is abundant liquidity available to finance economic expansion and job creation in America. 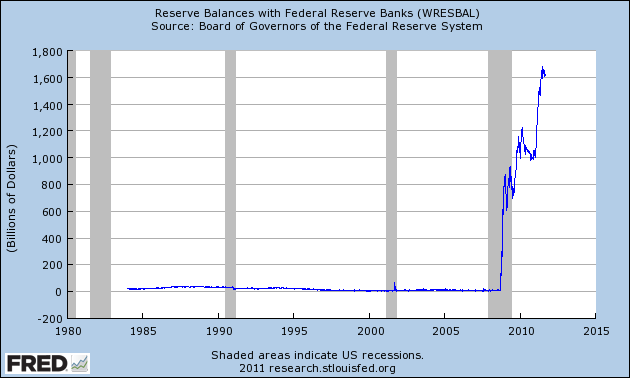 The banking system is awash with liquidity. It is a rare day when the discount windows―the lending facilities of the 12 Federal Reserve banks―experience significant activity. Domestic banks are flush; they have on deposit at the 12 Federal Reserve banks some $1.6 trillion in excess reserves, earning a mere 25 basis points―a quarter of 1 percent per annum―rather than earning significantly higher interest rates from making loans to operating businesses. 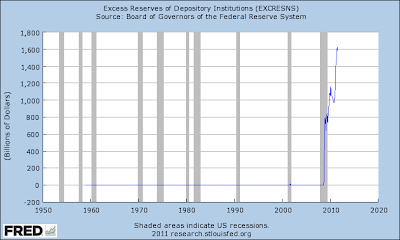 These excess bank reserves are waiting on the sidelines to be lent to businesses. Nondepository financial firms—private equity funds and the like―have substantial amounts of investable cash at their disposal. U.S. corporations are sitting on an abundance of cash―some estimate excess working capital on publicly traded corporations’ books exceeds $1 trillion―well above their working capital needs. Nonpublicly held businesses that are creditworthy have increasing access to bank credit at historically low nominal rates. I do not believe it wise to commit to more than that, or to signal further accommodation, when the cheap and abundant liquidity we have made available is presently lying fallow, and when the velocity of money remains so subdued as to be practically comatose. At the FOMC meeting, the committee announced that it “currently anticipates that economic conditions … are likely to warrant exceptionally low levels for the federal funds rate at least through mid-2013.” In monetary parlance, that is language designed to signal that we are on hold until then. So -- in short, there is already ample cash in the system which is not being lent. Let's take a look at the underlying data he is relying on. We're still seeing very weak to non-existent loan growth. 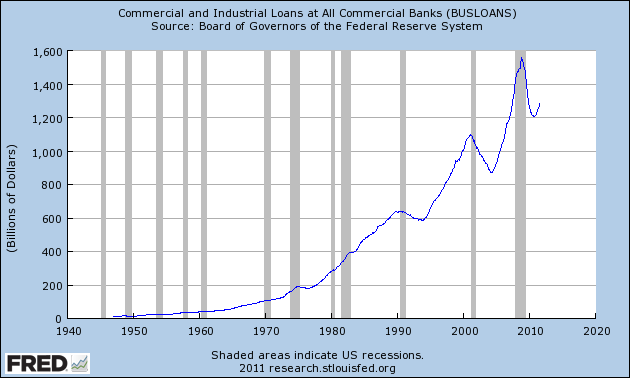 From the top down, commercial and industrial loans are growing weakly, consumer loans are moving lower (the spike was caused by technical factors, not actual loan growth) and real estate loans are still decreasing. In short, there are simply a dearth of transactions occurring right now; people have hunkered down and are spending as little money as possible. This is a big reason for the increase in personal savings we've seeing over the last few years as well as the high cash balances at corporations. At this point, I think it's fair to characterize Governor Fisher's argument as, "we've already done all we can do and it's not helping. 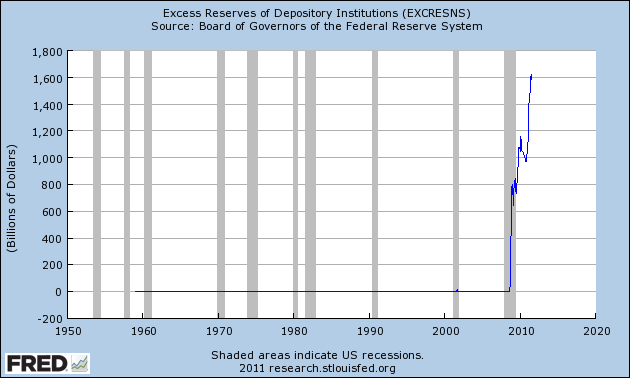 We've not going to reverse our decision -- we're not going to start depleting these excess reserves -- but we can only do so much." First, in reporting my views to the committee, I noted my concern for the fragility of the U.S. economy and weak job creation. It might be noted by the press here today that although I am constantly preoccupied with price stability―in the aviary of central bankers, I am known as a “hawk” on inflation―I did not voice concern for the prospect of inflationary pressures in the foreseeable future. Indeed, the Dallas Fed’s trimmed mean analysis of the inflationary developments in June indicated that the trimmed mean PCE turned in its softest reading of the year. 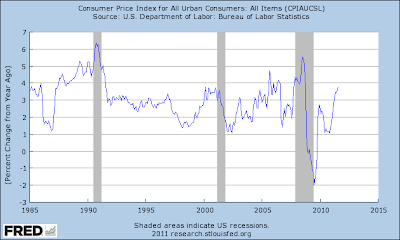 The trimmed mean analysis we do at the Dallas Fed focuses on the price movements of personal consumption expenditures. It is an analysis that tracks the price movements of 178 items that people actually buy, such as beer, haircuts, shoe repair, food and energy prices. In June, the trimmed mean came in at an annualized rate of 1.3 percent, versus 2.1 percent for the first five months of the year. The 12-month rate was 1.5 percent. My concern is not with immediate inflationary pressures. Core producer prices are still increasing at a higher than desirable rate. But I have suggested to my colleagues that while many companies have begun and will likely continue to raise prices to counter rising costs that derive from a range of factors—including the run-up of commodity prices in 2010 and increases in the costs of production in China—weak demand is beginning to temper the ability of providers of goods and services to significantly raise prices to consumers. For more on the Dallas Fed's trimmed mean PCE tool, see this link. What is important to recognize is that -- despite Fisher being an inflation hawk -- inflationary concerns are not the reason for his dissent. This is an important point -- and one that I don't think has been made with enough emphasis in the press. My concern is with the transmission mechanism for activating the use of the liquidity we have created, which remains on the sidelines of the economy. I posit that nonmonetary factors, not monetary policy, are retarding the willingness and ability of job creators to put to work the liquidity that we have provided. I have spoken to this many times in public. Those with the capacity to hire American workers―small businesses as well as large, publicly traded or private―are immobilized. Not because they lack entrepreneurial zeal or do not wish to grow; not because they can’t access cheap and available credit. Rather, they simply cannot budget or manage for the uncertainty of fiscal and regulatory policy. In an environment where they are already uncertain of potential growth in demand for their goods and services and have yet to see a significant pickup in top-line revenue, there is palpable angst surrounding the cost of doing business. According to my business contacts, the opera buffa of the debt ceiling negotiations compounded this uncertainty, leaving business decisionmakers frozen in their tracks. I would suggest that unless you were on another planet, no consumer with access to a television, radio or the Internet could have escaped hearing their president, senators and their congressperson telling them the sky was falling. With the leadership of the nation―Republicans and Democrats alike―and every talking head in the media making clear hour after hour, day after day in the run-up to Aug. 2 that a financial disaster was lurking around the corner, it does not take much imagination to envision consumers deciding to forego or delay some discretionary expenditure they had planned. Instead, they might well be inclined to hunker down to weather the perfect storm they were being warned was rapidly approaching. Watching the drama as it unfolded, I could imagine consumers turning to each other in millions of households, saying: “Honey, we need to cancel that trip we were planning and that gizmo or service we wanted to buy. We better save more and spend less.” Small wonder that, following the somewhat encouraging retail activity reported in July, the Michigan survey measure of consumer sentiment released just recently had a distinctly sour tone. It will be devilishly difficult for businesses to commit to adding significantly to their head count or to meaningful capital expansion in the United States until clarity is achieved on the particulars of how Congress will bend the curve of deficit and debt expansion and the “cloven hooves” are revealed. No amount of monetary accommodation can substitute for that needed clarity. In fact, it can only make it worse if business comes to suspect that the central bank is laying the groundwork for eventually inflating our way out of our fiscal predicament rather than staying above the political fray—thus creating another tranche of uncertainty. In short, Fisher's primary argument is uncertainty is the primary issue retarding borrowing growth. At this point, I would like to add my comments to this analysis. 1.) In my business dealings, I have heard some of the same arguments, especially related to the actual implementation of the health care law. A friend who is an attorney that works for a third party health care provider spent the better part of a year working through the regulations; they are dense and confusing. If this was a non-core benefit -- that is, if the legislation impacted an area ancillary to traditional benefits provided by employers -- I would let it slide. However, this is a core issue, meaning the complexity is an issue. Let me also add -- I'm not arguing against the law (in fact, I actually know very little about it and so can't comment on its substance). But, anytime there is a change of this magnitude (and this is a big and confusing change), it will have a negative effect on sentiment. indicates people are just not spending at high enough rates to get the economy moving. In an economy where 70% of growth is consumer driven, this is nearly fatal to the idea of strong growth. An economic theory that suggests that when a government tries to stimulate demand by increasing debt-financed government spending, demand remains unchanged. This is because the public will save its excess money in order to pay for future tax increases that will be initiated to pay off the debt. This theory was developed by David Ricardo in the nineteenth century, but Harvard professor Robert Barro would implement Ricardo's ideas into more elaborate versions of the same concept. Some will look at the high rate of current savings and say the above theory is true; people are saving to deal with their anticipated high level of taxes coming down the pike. To this, I would respond with, "why did the savings rate decrease during the 1980s when the government also ran massive deficits?" Put another way, during another time of incredibly high government deficit spending, consumer savings dropped, blowing a fairly large hole in this argument. 4.) We are in a period of massive upheaval caused by a myriad number of issues, but with the largest factor being the worst recession since the great depression (overall, I think the best explanation of where we are now is provided by Barry Ritholtz's book Bail Out Nation). The only way to prevent this situation from occurring again is through a massive regulatory overhaul. Additionally, there are incredibly large systemic problems in the economy (such as health care) which can only be dealt with through big changes. In short, the "regulation is killing business" argument can just as easily be characterized as, "we received massive benefits from the old way of doing things and may not get those same benefits from the new system, so we're going to complain loudly about the changes." In conclusion, I do believe there is statutory/legislative uncertainty right now. But, I also think a massive pick-up in demand would tamp that level of concern down in a big way. In short, if businesses were making more money, the "regulatory uncertainty" argument would go out the window. As mentioned above, all the markets sold off in reaction to the Fed's statement. Most importantly, the IWMs are a tad below support, with level EMAs. A strong move below their trend line would probably drag the other averages down as well. Depending on what trend line you use, the SPYs have a bit of room to run. The best news is the QQQs are still about the 200 day EMA. However, if the weight of the markets keeps moving lower, this won't hold or last. The TLTs rallied strongly on the Fed release on increased volume. Note the remainder of the chart is very bullish -- the EMAs are all moving higher, the shorter are above the longer and prices are using the EMAs for technical support. Also note that prices spend about a week and a half consolidating gains before the Fed meeting, giving the market some room to run. The dollar -- after consolidating around the 200 day EMA for the last week in reaction to the EU situation, broke higher yesterday in strong fashion. The reason for the gain is the overall expected effect of operation Twist -- in selling short term securities, the Fed will probably see a slight increase in short-term rates which is slightly dollar positive. Can you get a recession if housing doesn't play along? 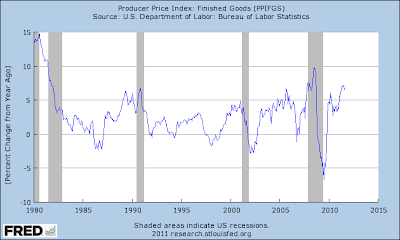 So -- the bottom line is total PPI is at uncomfortable levels in and of itself. However, while there is some bleed through to CPI, CPI is still lower, indicating that PPI can run at these levels without causing inflationary concern -- yet. But, these are figures that we have to keep an eye on going forward. The Consumer Price Index for All Urban Consumers (CPI-U) increased 0.4 percent in August on a seasonally adjusted basis, the U.S. Bureau of Labor Statistics reported today. Over the last 12 months, the all items index increased 3.8 percent before seasonal adjustment. Core is running at 2%. 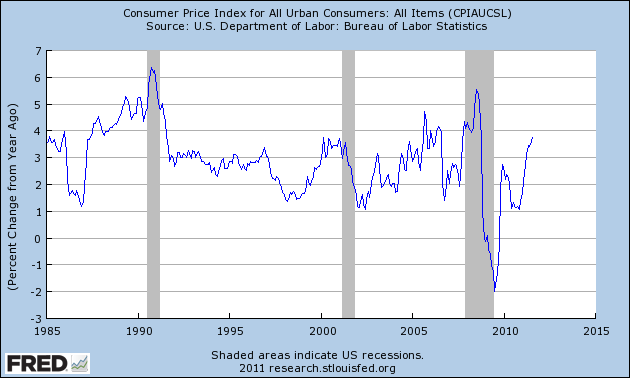 In addition, some of the recent bump can be attributed to CPI being at low levels over the last few years. 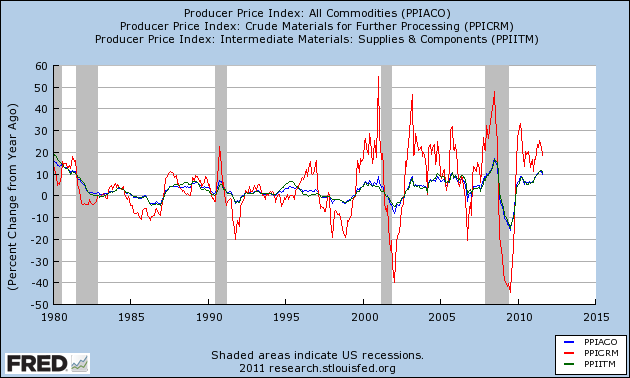 This tells us commodity price pressures are not bleeding into core prices. However, let's take a look at two important sub-sets of prices: food and energy. 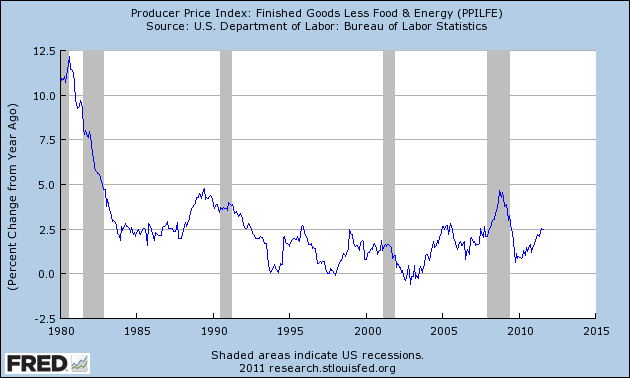 Food prices are running extremely hot; they are printing near their highest levels of the last 20+ years. Some of this spike is due to the low levels seen over the last two years. But, there have still been some very large price spikes as well. Also note these are levels associated with recession; when food prices have been at these levels in the past, a recession has followed. There are only two other historical data points to reference regarding this, so the evidence is not conclusive (ideally, we'd like to have more data to draw such an important conclusion). 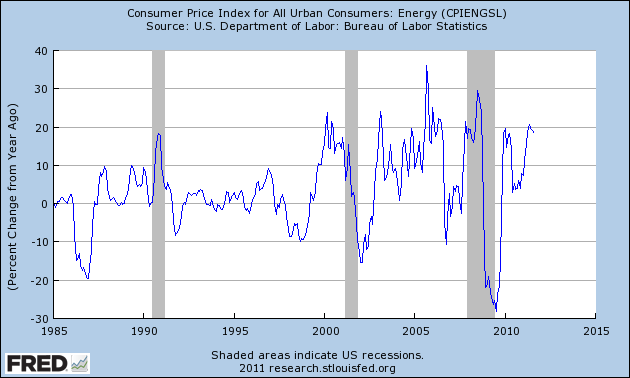 Energy prices are also very high. 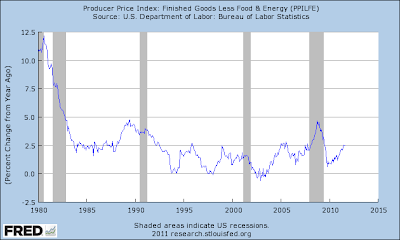 However, the economy weathered YOY price spikes similar magnitude in the last expansion and did fairly well. 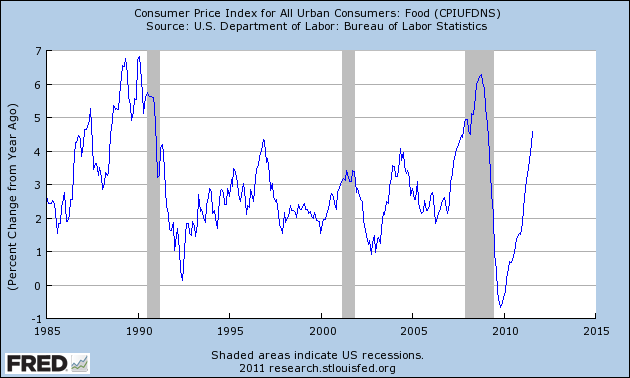 While the ability of middle men to absorb price increases and not pass them on is admirable, the bottom line is total CPI -- especially food prices -- is concerning. At 3.8% YOY it's running at higher than desired levels. In addition, the current trend is for more increases -- obviously not good. The good news is oil prices are lower and food prices (futures) have been moving sideways for the last 9-12 months. But there is ample reason for concern at the point. The SPYs took longer to break their uptrend, but they have done so. Also note it's possible to argue prices have also formed a double top over the last 4 trading days. While the TLTs moved higher yesterday, the daily charts shows they are still stuck below resistance. Also note the IEFs are having a hard time making significant upward progress as well. What's interesting is the dollar has now taken over safe haven bid status in the markets, being the "least dirty shirt in the hamper." Oil is still incredibly weak technically. Prices are below the 200 day EMA and have broken through short-term support. Also of note is the sell signal given by the MACD. This chart represents demand destruction -- people using less gas. It should also be noted this represents a stronger dollar. The total of these charts is still one of an economic slowdown or recession. Did the debt debate debacle disrupt the economic cycle? The only reason to qualify the typical leading/coincident/lagging indicator paradigm, in my opinion, is significant immediate government action. A decline in important foreign trading partner economies will show up in manufacturing data here first, as well as stock prices (as future earnings of companies with exposure are downgraded). An outright decline in those economies should also show up as decreased cash to invest in our bonds, and hence bond yields should rise. In other words, the importation of foreign weakness should show in leading indicators first. But imagine for example an immediate 50% tax increase on everything enacted by the government. Virtually every economic indicator would decline in unison. No leading/coincident/lagging steps there. The question is, was the confidence shattering debt ceiling debacle in Washington -- in which House Republicans even at the end could not muster a majority to vote in favor of paying our bills, even after Barack Obama offered up the crown jewels of the 20th century, Social Security and Medicare, as an enticement -- such an event? Only 174 House Republicans voted for the debt deal. They had to be rescued by Nancy Pelosi's democrats, otherwise the deal would not have passed and the US would have defaulted on its debts. The Euro crisis was in the headlines before, and intensified after that period, without any effect on the poll results. The S&P debt downgrade didn't happen until August 4, so is also not responsible. So what happened specifically in that period? Over the 4th of July weekend Barack Obama explicitly offered up Social Security and Medicare for sacrifice in a "grand bargain," and the sausage making over how to gut the fundamental social contract continued until the debt ceiling deal, which did not include cuts - for now - was passed on August 2. As mentioned above, even at the end the deal did not have enough GOP support to pass the House. 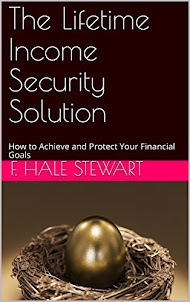 The result was, as Gallup reported, that Upper Income Americans' Economic Confidence [was] Shaken. The economic confidence of Americans with disposable income plummeted abruptly beginning during this period, to a bottom not seen since the depths of the recession. And when the affulent (roguhly the top 25%) cut back spending, the economy suffers immediately. The report is short but hard hitting, and I highly recommend you click throough and read it in its entirety. Since that time, we have seen July and August real retail sales turn negative, and same store sales for at least one service - Shopertrak - were totally flat YoY in the first full week of September. Bonddad and I had a number of conversations during and after that period, and both of us felt that something profoundly unnerving had occurred. Washington was truly under the thumb of lunatics, and the crown jewels had been offered up for potential evisceration. Is that itself sufficient to disrupt the normal progression of the economic cycle? Apparently we will find out together. In other words, we're looking at this from the seller's perspective. 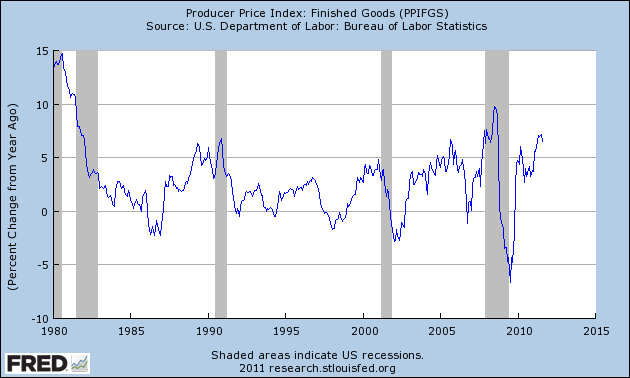 The Producer Price Index for finished goods was unchanged in August, seasonally adjusted, the U.S. Bureau of Labor Statistics reported today. Finished goods prices advanced 0.2 percent in July and declined 0.4 percent in June. At the earlier stages of processing, prices received by manufacturers of intermediate goods decreased 0.5 percent in August, and the crude goods index moved up 0.2 percent. On an unadjusted basis, prices for finished goods increased 6.5 percent for the 12 months ended August 2011, the smallest year-over-year advance since a 5.6- percent rise in March 2011. 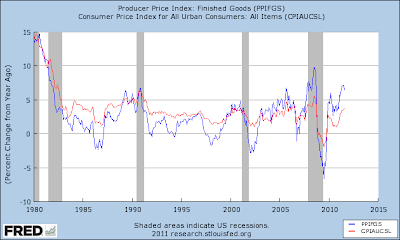 The above chart shows the YOY percentage change in PPI. Right now it's running pretty hot -- it's near the highest levels seen in the last 25 years. In addition, core PPI is still at very manageable levels. However, the above chart of PPI and CPI show that while PPI is having a general effect on CPI, PPI is running hotter than CPI. 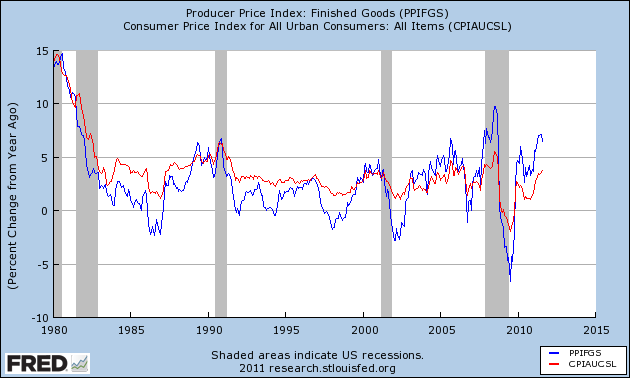 In other words, the level of bleed-through between PPI and CPI exists, but not in an extremely detrimental way. This relationship does need to be monitored, however. While there has been considerable debate (and at times consternation) regarding the use of core and total PPI (and CPI), it's important to realize why this is done. Commodity prices are in part seasonal and also deeply effected by supply and demand. As such, they can vacillate wildly. But serious upswings are the standard remedy for the following downswing -- or, more specifically, the cure for high commodity prices is high commodity prices. By using two different measures -- total and core -- we can see if high commodity prices are in fact bleeding through to core prices, to see if high commodity prices are taking root in the overall price structure that exists throughout the economy. 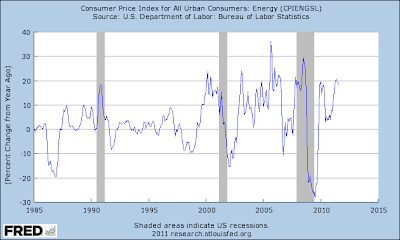 The above chart shows the YOY percentage change between crude, intermediate and final goods. 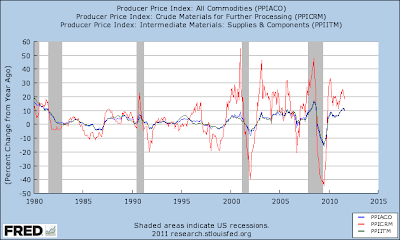 The red line -- show shows crude goods -- is moving around a lot, while intermediate and final prices aren't. This tells us that huge swings in crude goods (raw material inputs) are being absorbed in later stages of production. 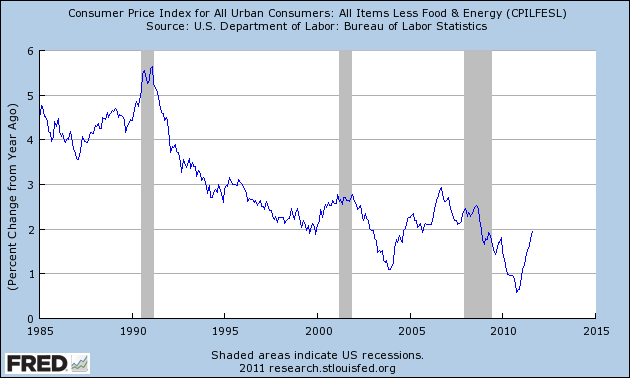 This is further reason why economists note the difference between core and non-core prices. Yesterday, the market opened sharply lower, but then rallied several times with the most impressive being the end of the day rally on increased volume that hit resistance about 20 minutes before the close. As the daily chart shows, prices moved between the 20 and 50 day EMA. 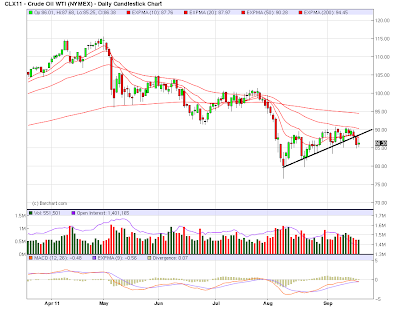 However, overall remember that prices are still in weak technical shape, essentially in a bear market pennant pattern. The longer end of the Treasury curve is still having difficulty making a strong advance. Earlier in the day, treasuries were up on extremely (what is for Treasuries) bullish news; serious questions about the viability of the EU situation. But prices simply could not maintain the rally -- and this after a large gap higher on the TLTs at the open. The above 5-minute chart adds important clarity to the treasury picture. After gapping higher at the open, prices moved sideways until they hit the 10 minute EMA. They followed the EMAs higher, but then sold off as the close approached. In other word, this was not a strong, day-long rally, but instead a gap higher at the open with little follow-through. The dollar moved higher today, advancing through the 200 day EMA and moving through key resistance levels. However, notice the declining volume tallies over the last week. My guess is we're seeing a consolidation of the dollar after a sharp move higher.